In these pages you’ll find rolling green hills, weekend junk trips, gambling grannies and pooches on parade; walled village houses and old film studios; Sung-dynasty temples and rice farmers’ implements; fish markets, folk museums and wakeboarding clubs; a Chinese herbalist’s shop and the tools of ancient trades; sampan ladies, fleets of ferries, and ships of all shapes! 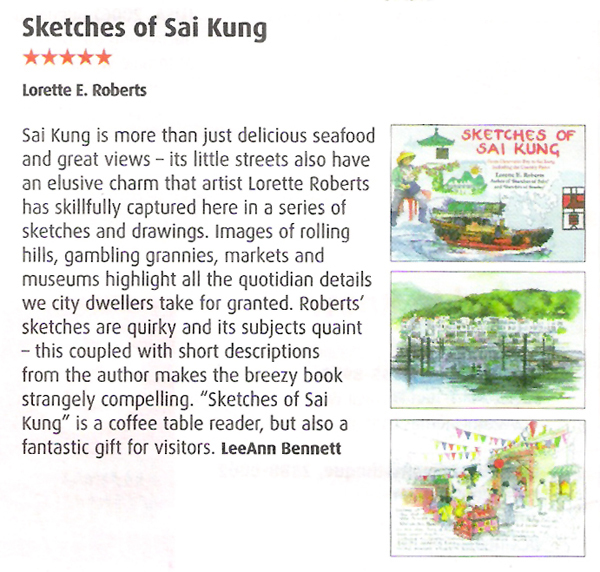 Third in a series of bestselling books, Sketches of Sai Kung paints this beautiful area of Hong Kong in a new light. Lorette E. Roberts is a British artist and illustrator based for many years in Hong Kong. Now living in Suffolk in the UK, she still visits Hong Kong several times a year. Born in Bath, England, Lorette began her career as a botanical artist but has since developed a broader range of styles, depending on the subject matter. Her work is typically vibrant and versatile, with a focus on people, places and objects. Her art has been exhibited at many venues in Hong Kong and overseas.